The bioshield structure is rising at the heart of the Tokamak Building. 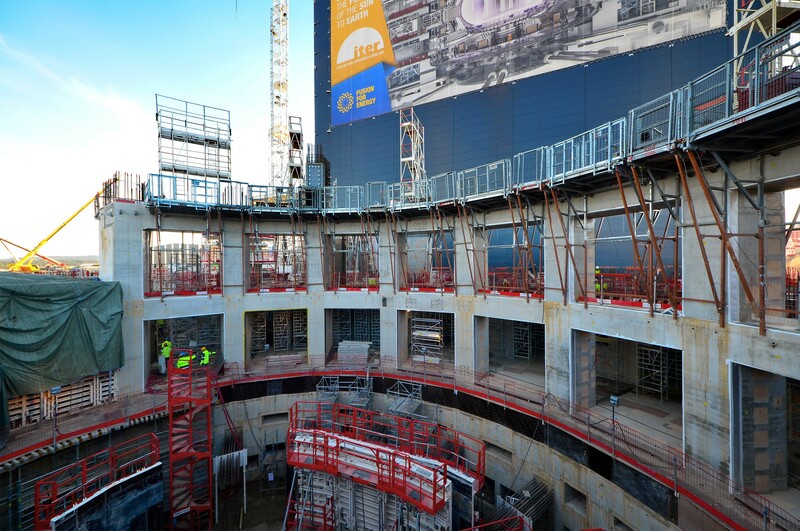 The last plot of the B1 level was poured last week; about half of the first ground level (L1) is now complete and the first elements of L2 are in place ─ namely the first of 18 massive embedded plates, each weighing 4.5 tonnes. These plates will support the temporary sub-assembly tool bracket (the rectangular blueish structure visible in the axis of the third column from the left). The large openings in the circular structure of the bioshield are for the cryostat bellows that will connect the machine to the port cells for systems such as remote handling, heating, diagnostics, etc.